This week saw an epic showdown between NM Daniel Lowinger and Nicolas Checa. In their three game encounter, Checa started off strong winning the first game. Lowinger even the score in the second round and the final round was draw leading to a tie 1.5/1.5. Meanwhile, Melvin Patrick and Grant Wang took care of business in their section, both defeating Al Pinto and Wendy Cummings. 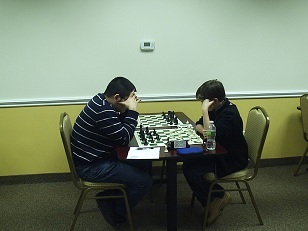 In their final round encounter, Patrick pressed into the endgame up a pawn. Wang resisted accurately and the game was drawn.